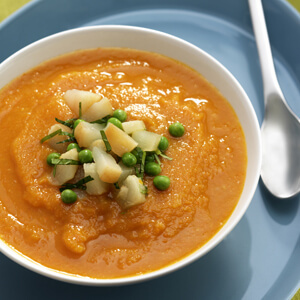 This soup by renowned Chef Vitaly Paley is easy to make, as it uses water instead of stock. Water lets the squash realize its full potential here. Pears, winter squash, and apple cider all appear on farm stands at about the same time, and their varying degrees of sweetness have a natural affinity for one another. Curry powder adds an exotic kick and helps balance the sweetness of the other ingredients. In a 6-quart soup pot, heat the olive oil over medium heat. Sauté the onion, stirring frequently, until soft, about 5 minutes. Add the squash and pear and season with salt and pepper. 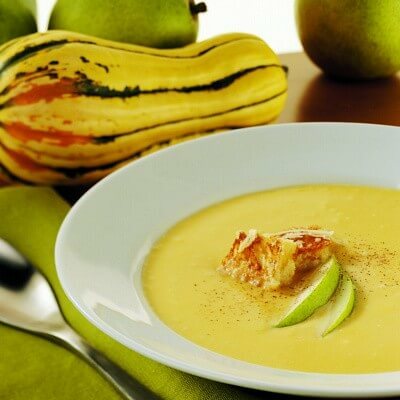 Decrease the heat to low and cook, stirring occasionally, until the squash softens and slightly caramelizes, about 15 minutes. Add the curry powder and continue stirring for 1 minute to let the curry flavors bloom. Pour in the apple cider. Increase the heat to medium, add the 3 cups water, and simmer until the squash is completely cooked through, about 30 minutes. Stir in the cream and return the soup to a simmer. Season with salt and pepper. In batches, carefully liquefy the hot soup in a blender. To serve, pour the soup into bowls and garnish with a dollop of crème fraîche and dill sprigs. This soup can be made a day in advance, cooked in an ice-water bath, and refrigerated overnight. I always season long preparations like soups or stews at the beginning of the cooking and adjust to taste at the end. Seasoning early means the salt and pepper get absorbed more evenly for a more balanced and uniform flavor.